Everything you need to make your own delicious, meaty meals is included in Napoleons Meat Lovers Starter Kit. 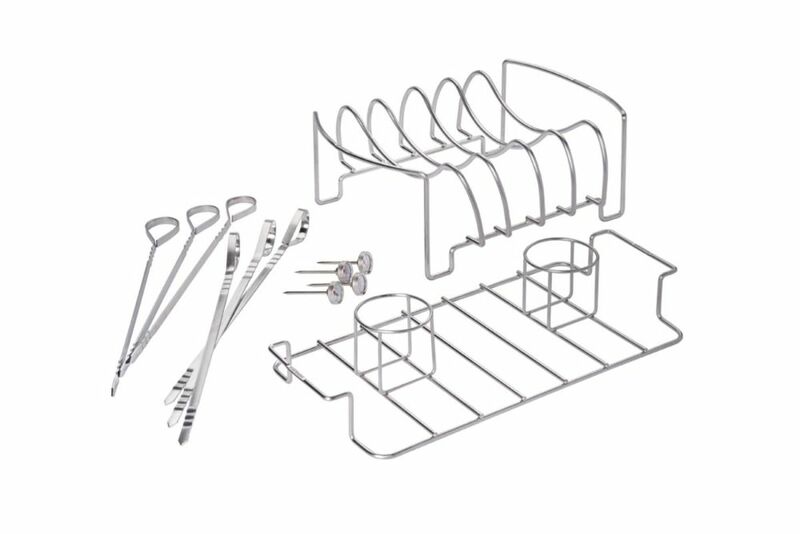 The Stainless Steel Rib Rack is the perfect way to grill up multiple racks of ribs, or roast some delicious beef. Double your fun with the Stainless Steel Double Beer Can Chicken Roaster. This roaster has two cradles for holding your favorite bubbly beverage in place. Build your own kebabs with Six Stainless Steel Skewers. The four, included, Stainless Steel Button Thermometers are perfect for ensuring everyone gets a steak grilled to perfection. RIDGID offers the ability to power all your 18-Volt tools with this 18-Volt Hyper Lithium-Ion Starter Kit. The 18-Volt charger features Rapid Charge Time, Smart Charging, Cold/Hot Warning and Energy Save Mode. The 4.0 Ah battery gives users prolonged run time and more charges over its lifetime compared to standard lithium-ion batteries. Backed by a standard 3-year warranty that covers free parts and service, this power pack includes one R840086 4.0 Ah Battery, one R840095 charger and operators manuals. Meat Lover's BBQ Starter Kit Everything you need to make your own delicious, meaty meals is included in Napoleons Meat Lovers Starter Kit. The Stainless Steel Rib Rack is the perfect way to grill up multiple racks of ribs, or roast some delicious beef. Double your fun with the Stainless Steel Double Beer Can Chicken Roaster. This roaster has two cradles for holding your favorite bubbly beverage in place. Build your own kebabs with Six Stainless Steel Skewers. The four, included, Stainless Steel Button Thermometers are perfect for ensuring everyone gets a steak grilled to perfection.